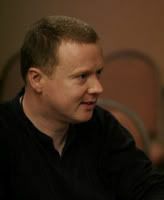 Allan Guthrie is an award-winning Scottish crime writer. His debut novel, TWO-WAY SPLIT, was shortlisted for the CWA Debut Dagger award and went on to win the Theakstons Crime Novel Of The Year in 2007. He is the author of four other novels: KISS HER GOODBYE (nominated for an Edgar), HARD MAN, SAVAGE NIGHT and SLAMMER and three novellas: KILL CLOCK , KILLING MUM and BYE BYE BABY. When he’s not writing, he’s a literary agent with Jenny Brown Associates. He also runs Criminal-E, a blog on ebook crime fiction. He met me at The Slaughterhouse where we talked about psychosis and vegetables. Do you think that the pathology of extreme psychosis such as evinced by a paranoid schizophrenic is more disturbing than the psychology of a gangster in terms of crime fiction or is there no divide? What we’re talking about is abnormal behaviour, and whether or not it comes about through mental illness or personal choice. At least that’s what I hope we’re talking about. I don’t think there’s an easy answer. If you’re talking about a gangster like Tony Soprano, then he’s certainly a disturbing guy. But then so are Jim Thompson’s first person narrators. Not much to choose between them, I don’t think. Of course gangsters can be paranoid schizophrenics too. Wasn’t Ronnie Kray a sufferer? I think different influences show up in different books. I’ll try to pinpoint them. Two-Way Split: David Goodis, the godfather of noir. I set out to see if I could write a modern noir novel set in Edinburgh and Goodis was my yardstick. Also some hardboiled detective authors from the same period. Wade Miller in particular. The major influence on this book wasn’t literary though: it was David Lynch. Kiss Her Goodbye: Day Keene, another ’50s writer like Goodis. Again, the major influence wasn’t literary, it was a technique I discovered from scriptwriting which I used to develop the plot. Hard Man: Scotland’s most talented exponent of literary crime fiction: Ray Banks. He gave me the kick in the arse I needed to write the book in several character-specific third person voices. Another major influence was Monty Python. And also the movie Old Boy (and several others which are name-checked as section headers). Savage Night: Really tough to pinpoint a literary influence here. The title comes from another ’50s noir master, Jim Thompson, who I mentioned in the previous answer. But I don’t think the book owes much else to him. Possibly the character of Park is a bit like some of Thompson’s psycho narrators. You might guess it owes a lot to Ted Lewis — GBH in particular. And I’d agree if it weren’t for the fact that I didn’t read GBH until after I wrote this. If I’d read GBH first, I probably wouldn’t have bothered, since GBH is so good it makes everything else seem pointless. Anyway, the major influence in Savage Night comes from the movies again. The chopped-up chronology of the narrative was just me wondering why we rarely see this in fiction when we see it in the movie world all the time, and wondering if I could make it work. Slammer: This one’s the novel that’s most like Jim Thompson, I think. Probably because I use an unreliable narrator, which he’s famous for. I read quite a few prison books as research, so they were undoubtedly influential: Jimmy Boyle, Erwin James, James Campbell, Malcolm Braly, a number of others. All my books are pretty heavily influenced by Jacobean Revenge drama and all kinds of absurdity, from Alfred Jarry through Monty Python to Erskine Caldwell, Charles Willeford and Douglas Lindsay. I also read a lot of screenplays, and that might show in terms of the visual writing, minimal description, terse dialogue, short scenes. I only started reading lots of screenplays in the last few years, so it may not be a direct influence, but movies certainly are. To what extent do you think that revenge is lawless justice and why do you think it is such a strong dramatic device? I think ‘lawless justice’ would be making quite an assumption about revenge. Sometimes the avenger is mistaken and an innocent person suffers. So while there’s a perceived notion of justice initially, it may not last. Even if it does, an objective observer may look at matters differently. With regard to its dramatic potential, revenge is emotionally motivated and almost always requires the avenger to be active. The victim often has to be active in defending themselves. All of which creates vast amounts of conflict. Which tends to result in quite a bit of drama. How do vegetables feature in your writing? Can I assume you’re referring to a short story called The Turnip Farm? That’s a story about someone who loves vegetables. I mean he really, really loves them. I thought everyone would enjoy a bit of absurdist bucolic erotica, but I was studying for a creative writing MA when I wrote it and my tutor — otherwise a man of excellent taste — didn’t care for it one little bit. Can’t win ’em all. The story’s in the annual Best British Crime anthology, if anyone cares to have a look. Lots of good stuff in there, even if you agree with my tutor about The Turnip Farm. Do you think that humanity is motivated by a will to power and how does this manifest itself in crime fiction? I can’t speak for humanity, but my observations of most of the people I know is that they’re motivated by pretty basic needs such as keeping themselves and their families warm, fed and safe. That applies to most of the characters in my books too. Even in Hard Man, which could be seen to be about various power struggles, the motivations for everybody’s actions are related to family. I’m trying to think of an exception but I can’t. I just write hardboiled soap operas, you know. What do you think the future of E books is? I see eBooks becoming the dominant format and good books finding readers more easily than ever. The industry will adapt and bring out the sort of niche imprints they couldn’t afford to invest in otherwise. Bright new digital publishers will spring up. The market for short stories and novellas will explode. Writers will love the freedom to experiment, while continuing to publish traditionally (or not). Readers will love the choice and, eventually, the price. Do you think it’s possible to write a novel that can go straight to film? Certainly some books lend themselves to adaptation better than others. THE MALTESE FALCON springs to mind. Hammett’s technique is perfect for movie adaptation. His storytelling relies entirely on action, dialogue and description. He never tells you what his characters think or feel. Those are the same restrictions movies impose on the writer (voiceovers aside). Anyone else who writes in the Hammett style enjoys the same benefits when it comes to screen adaptation. But no matter how cinematic a novel might appear to be, it’s unlikely to go straight to film unless it’s an incredibly short novel (or an incredibly long film). Some of the best writing in the world is coming out of the genre of crime fiction, do you think that there is a formula for the Booker Prize? The first part of your sentence may well be true. I’ll have to take your word for it because I don’t read widely enough to be able to judge. As for the question: I expect that if you analyse any data closely enough you’ll uncover patterns which will create the appearance of something that’s less than random. So I’m sure it’s possible to find a formula. I’m not sure of what value it would be though. Giving somebody a formula for writing a novel doesn’t make them a good writer any more than giving somebody a recipe makes them a good cook. Or are you suggesting that the formula is one which excludes crime fiction? I don’t know. I expect a lot has to do with labelling. You could argue, for instance, that TRUE HISTORY OF THE KELLY GANG is an historical crime novel. Do you think crime writing is motivated by a desire to control death? My motivation for writing crime fiction is far more prosaic (as far as I’m aware). I just enjoy writing the kinds of stories where characters are placed in extreme situations. And I like exploring the emotional consequences of that. I would say, though, that there’s an element of playing God involved in all writing, not just crime writing, in as much as the author creates an imaginary world in which he decides who lives and who dies. But that particular aspect is not my motivation for writing, simply a side-effect of it. I write because I have stories to tell about characters I hope readers will find interesting. 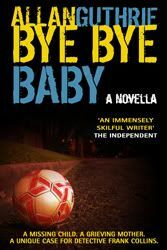 Back at the tail-end of last year, I made a couple of short novellas available as eBooks, Bye Bye Baby and Killing Mum. They ended up in the Kindle Bestseller charts, peaking at #6 and #25 respectively. So I’m working on a third novella which’ll also be released digitally. Kill Clock was originally published in print by Barrington Stoke in 2007 but I’m overhauling it at the moment. The new version is now on its fourth round of edits. I’m lucky enough to have had some superb editorial feedback, so have been working on that, trying to do my editors justice. We still have the same basic story, but I hope that even those who’ve read the first edition will enjoy the new version once it’s available. Besides Kill Clock, the print version of Bye Bye Baby (also from Barrington Stoke) is out in November. I’m hopeful I’ll be able to announce some information about digital versions of my backlist novels soon too. Plus a collaborative horror novella. But I can only hint for now, I’m afraid. Thank you Allan for giving a great and informative interview. The Debut Dagger discovers some real jewels! Thanks for the interview! Smashing interview. Alan’ s one of the best writers around, though I’ll never look at Bubble& Squeak in the same way again. I’ve been picking up quite a few Indie Noir/Crime fiction books lately on the ol’ Kindle. This was on my list. Good to hear from the chap behind the words. Interesting interview. I agree that at the core, people are motivated by the desire to procure and sustain access to resources for basic needs- food, shelter, etc. and I think the desire for power is a sort of extension of that- the survival drive as well as the more aloof desire to differentiate ourselves from others, have “legacy”. Security, and ego. Many authors have different views it seems on ebooks, and there is still resistance out there. I don’t know how the publishers can maintain viable “imprints” and provide royalties to writers in an electronic age without resorting to proprietary gimmicks like restricting devices and readers and the files downloaded- something that is getting harder to enforce. I hope that writers, somehow, get compensated for their work. Thank you, as always, for the read. Great to see this interview with the master. I particularly enjoyed the list of influences for each novel – that’s quite an amazing list and I wouldn’t have picked Monty Python in a million years. I’d really like a look at those screenplays (wouldn’t we all) so fingers crossed, and if anyone hasn’t read a Guthrie yet, there’s only one thing for it (follow the links, click buy). I enjoyed this interview. Love the line: “Giving somebody a formula for writing a novel doesn’t make them a good writer any more than giving somebody a recipe makes them a good cook.” Still, the question of whether Booker winners follow a formula that excludes crime fiction is intriguing. Allan’s one of the sharpest writers out there. Short stories, novellas, novels–they’re are all dark, absurd and delicious. He writes characters in extreme situations with remarkable clarity. Judging by his responses, Allan Guthrie impresses me as a down-to-earth author, the kind who in my opinion seem to write the best crime fiction. I enjoyed the interview. As always, the Godwin’s questions are intelligently probing. Thanks for hosting the interview, Richard. Great questions! Jenny: re The Debut Dagger. Absolutely. Look out for a fabulous Canadian writer called Peggy Blair. I had the privelege of reading her 2010 Dagger-nominated novel last year and it was one of the finest books that came my way. Penguin Canada bought it. It’s called THE BEGGAR’S OPERA and is set in Cuba. Paul: Thanks! Sorry to spoil Bubble And Squeak for you. I do that with everything. Carrie: Great to see a fan of indie crime/noir titles. Have you checked out Nigel’s short story collection, Dirty Old Town? Terrific stuff. Lynn: I hate to generalise. It gives me hiccups! Ebooks are a godsend for writers, though, there’s little doubt about that. Nigel: Thanks, sir. And with regard to Monty Python influence in HARD MAN: the guy in the basement known as Jesus — his real name is revealed later on as Brian. I don’t think anyone’s ever spotted the connection. On the screenplay front: you never know. I don’t want to tempt fate, but Two-Way Split is looking very promising. LJ: I’m fairly sure I must have purloined that formula/recipe line. Too good an analogy for me to have rustled it up myself! Chris: Thanks very much, sir. Generous words indeed. I’d say Benjamin Seigel was probably certifiable. He for sure had the rage and the terrible clarity of vision and purpose that define the true psychopath. (On the other hand I read and tremendously enjoyed “The Turnip Farm” — so that alone makes my own sanity questionable). My nomination for the straight to film novel would be, To Kill A Mockingbird. When Mr. Guthrie speaks, I listen, hard. First time I read Killing Mum and Bye Bye Baby it felt like someone had reached out and slapped me silly. Really appreciated Allan’s outlook on the e-book business. Practical views of a burgeoning industry from an experienced bookman. Salvatore — thanks! I think it’s true that my writing’s pretty down-to-earth too. I hope so. AJ — Cheers. Good call on TKAM. And I’m very pleased you enjoyed the slapping! I dig your cut and dried answers, Mr. Guthrie. The first thing I ever read (listened to, actually) of yours was The Turnip Farm. Strange as it was, I got a pleasant taste of your mettle. The ebook thing, though, it seems like the chick telling the dude Don’t worry, I’m on birth control… What you and others in the know are saying seems logical enough, and yet a part of me hangs back, says Dude’s gonna end up paying child support… Truly, I hope not, I hope it’s one great long ride. I agree re: the element of God in writing. Not the driver, but it sure is fun. Well, you seem one sharp writer and agent and I’ll enjoy next tasting one of your novels. Richard? You got another hot one here. Thanks. Thank you Allan for giving an informative and insightful interview.